At the scrubby Bastille end of the Viaduc des Arts is Europe’s biggest Eye Hospital, the Quinze-Vingts. Looking across the underground car parks and rubbish strewn concrete wastelands to the untidy collection of buildings that make up this institution, a silly pun pops into my head. Is this sight for sore eyes or a site that has become an eyesore? For those in Paris with ocular defects at least, it is an electric blue beacon of light. 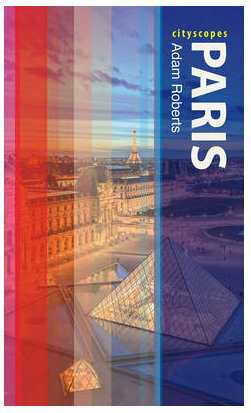 The hospital is trapped in a vicious triangle between the Viaduc des Arts and the Opéra Bastille, and finding the entrance is difficult even for those with perfect vision. Cities do their best to get us lost, bombarding us with a quantity of visual stimuli that is too great for our eyes and brains to cope with. Just to advance along a street we need to constantly filter what we see, but this process of filtering means that much of our environment becomes invisible. I eventually find the entrance on the Rue de Charenton, curiously an ancient stone gateway, which leads me through to pure 1960s brutalism. I have found the hospital, but still don’t see the logic in the cryptic name of the establishment. Later I discover that it is in fact a remnant of a bizarre system of medieval counting, representing three hundred (15x20), the number of beds planned for the original hospital building. This is an institution that can look back at a very long history. 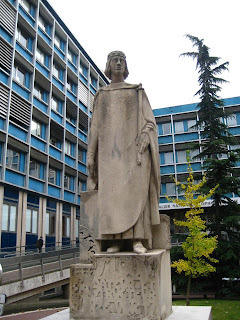 Louis IX (Saint Louis) created the original Quinze-Vingts hospital in 1260, partly to look after the blind people of Paris but principally for another reason. This was a time of crusades, and many of the soldiers returning with him from the Orient were suffering from one particular affliction - blindness. The defending Saracen armies had chosen a gruesome message to send to others who were thinking of enforcing the message of Christianity. Captured invaders would have their eyes gouged, but their lives spared. Christ may be the light and the way, but those who came to attack wouldn't be able to see it. The hospital eventually moved to its current plot in 1780, but most of the buildings on site today date from the 1950s and 60s. The architects of this post-war rebuild apparently decided to make the hospital as visible as possible in its landscape, dressing the buildings in cornflower blues and concrete honeycombs. A classical statue of Louis IX on an art-deco pedestal faces away from the hospital, and these are indeed not buildings to be admired from the outside. This is an establishment for tired eyes though, and a clever system of blinds and shuttering ensure that it is a healing one. On the eastern side of the plot, new University and Research buildings are springing up. Today's architects seem to have a different view to their predecessors, and these are sleek, glazed structures. The most spectacular is the recently opened Institut de la Vision, an ironic name for a building that wants to be invisible. The blue reflections of the older buildings merge into reflections of a cloudy white haze, as the building disappears into the sky. Looking back to the Eye Hospital, I can't help but think of the Day of the Triffids, a story which asks how long we would survive as a species if our sight was snatched away from us overnight. Sight is our most abused sense, but also the most abusive, limiting the power of the four others. Inside the buildings of this hospital, the afflicted are perhaps being protected from the destructive spectacles of the outside world. Without eyes, we lose the superficiality of sight and are forced to concentrate on other stimuli. Without sight, we learn to listen more, and when we listen we think more clearly. To see is to understand, but what use are our eyes if we don't make the effort to understand what we see? Certianly not a masterpeice when it comes to the architecture ... but to take care of your eyes, it's a good place! Of course I don't mind - in fact, I'm planning to link back to one of your previous posts soon! The main buildings are not attractive, but I think they are functional. If you are in the area though, you should go down the Rue Moreau to see the really quite astonishing new Institut de la Vision building. Je ne sais si j'ai tout compris, je me suis fait la remarque que les immeubles à façades de verre sont invisibles et donc s'intégrent bien à l'environnement ; pas sûr, encore faudrait-il qu'ils soient en miroir. Comment s'intégrer à un ciel gris lorsqu'on est bleu ? Je suis très bavarde, alors j'espère que ton français est OK.
J'avais surtout été impressionnée par tout ce qu'on trouve DEDANS le canal et qu'on ne voit pas lorsqu'il est plein. En effet, la face cachée des choses. Bonjour Cergie, et bienvenue! Mon français est ok, surtout côté comprehension écrite - par contre, toujours un sacré accent anglais qui va jamais me quitter je crois! Pour la côté invisible des immeubles en verre, normalement je ne suis pas fan, mais ce que m'a frappé ici était le contraste avec les anciens immeubles. Il y a 40 ans on a fait des constructions très visible, mais aujourd'hui, apparement il faut les caché. Dans le contexte d'un Hopîtal des yeux, j'ai trouvé ça assez drole. En fait, cet immeuble est intéressant car il n'est pas qu'en verre. 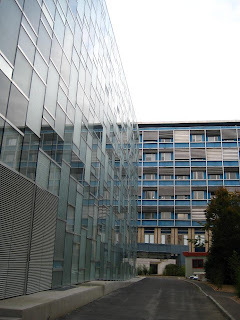 C'est un melange de gris et de verre (bleu) pour 3/4 de l'immeuble, puis surtout devant, il y a une courbe vers le ciel qui fait qu'on a l'impression qu'il disparaît. On peux le voir un peu ici. I am normally fascinated by architecture, but this time I was more interested in the history of services to the blind. It is so difficult to find reliable histories pre-1900, so I'm grateful for the link.